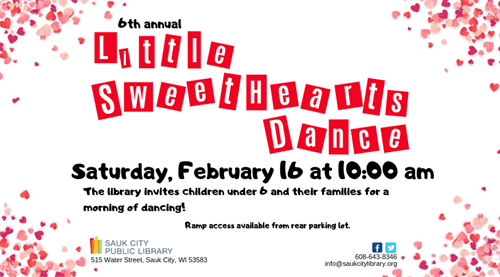 The library invites children under 6 and their families to join us for our 6th annual dance. Refreshments and crafts will be provided as well as a calming room for anyone who needs a break from dancing the morning away. It is the social event of the season for kids 0-5 years and their families! Make plans to attend! Invite your friends!